Lock in a great price for Motel One Paris-Porte Dorée – rated 9 by recent guests! I like the clean bathroom, with very comfortable towels, the nice shampoo and the soft toilet tissue. The bed is big enough for myself and the quality of the bed facilities is great high. Also it is near a big park, I walked in the morning and it was great. The stuff are friendly , the location and modern furniture are good. Great facilities, brand new which is a must compared to usual hotel in Paris. Amenities are nice, a lot of room to hang out in or out, bar... Excellent service! The staff always smiling and nice, the breakfast is good. Beautiful hotel. Rooms, being in Paris are small, but overall was great. Great value for your money. Smelled great. One of our top picks in Paris.Located in the 12th district of Paris, Motel One Paris-Porte Dorée provides a garden and an on-site bar. The property is located a 6-minute walk from Porte Dorée Metro Station, 2.5 mi from Opéra Bastille and 3.7 mi from Noter Dame Cathedral. The air-conditioned rooms feature a desk and a flat-screen TV. They also have a private bathroom with a shower, a hairdryer and free toiletries. All rooms are serviced by a elevator and free WiFi is available throughout the property. A buffet breakfast is served daily at the property, which includes organic and fair trade produce. There is a 24-hour front desk and a luggage storage at the property. Louver Museum and Pompidou Center are 3.7 mi from Motel One Paris-Porte Dorée, while Place de la République is 3.4 mi away. Paris - Orly Airport is 7.5 mi from the property. 12th arr. is a great choice for travelers interested in monuments, culture and museums. When would you like to stay at Motel One Paris-Porte Dorée? This air-conditioned room features a desk and a flat-screen TV. It also has a private bathroom with a shower, a hairdryer and free toiletries. Public parking is available on site (reservation is needed) and costs EUR 16 per day. House Rules Motel One Paris-Porte Dorée takes special requests – add in the next step! Motel One Paris-Porte Dorée accepts these cards and reserves the right to temporarily hold an amount prior to arrival. Please inform the hotel if you are accompanied by one or more children. Please note that the number of people mentioned per room category is the maximum number of people that the room can accommodate, adults and children included. Please note that the underground parking is limited and is only available for cars with a maximum height of 6.2 feet. Reservation is mandatory. Nothing big. Only the room was hot, I made the air conditioner/heater to the lowest level possible, yet I couldn’t manage. It was still a little bit hot I think. I found the hotel clean, the personnel very friendly, and also a good price/performance. It is also easily reachable from central areas in Paris. From the hotel it takes around 5 minutes to the metro station “Porte Doree” by walk. Then it takes around 20-25 minutes to a central location e.g. Notre Dame. There are cafes and restaurants and a big park nearby. I didn’t have breakfast so I can’t comment on this. I would stay again in this hotel and recommend it to anyone. Air conditioning is bad and too hot and not any choice. The hotel is very stylish and every stuff is kind. The room is clean and looks like new. The amenities is also nice and everything is fine except air conditioning. The location is so convenient to go sightseeing and any station . We can go to station directly by bus. Then there’s a big beautiful park near the hotel. And the breakfast is so delicious!! The bread is soft and all foods of breakfast are worthy to pay additionally. The air conditioner doesn’t have the cold mode. If I don’t open the window, it will be very uncomfortable without fresh air. If I open the window, It will be very noisy because it’s near the highway. I didn’t like how expensive the breakfast is. I liked how clean it was and how nice the decoration is inside. The room was a nice size and very clean. I could not boil water in my room. The location of the hotel is good, the park across to it is very big and beautiful. The decoration of the lobby is very cozy and charming, it is prefect to have some cocktail/beverage at the bar in the lobby after a whole day of travelling. The room is very clean and bed is very comfortable. However, only very limited rooms can see Effiel towel, and if you book the cheapest one the room is quite small. Couple more vegetarian choices to choose from re: sandwiches in the evening please! Staff super friendly despite our lack of French! Brilliant location for shops, bus and metro. The room was far too warm day and night. Asked staff who told me that the air con only had the ability to heat. Apparently this is the same of all Paris hotels (I’m not sure that’s true) we slept with the window open, although this only partially did the trick - and then of course you have the noise of the street below. My advice would be to ask for a room that doesn’t face the sun. Advice I was given by the staff upon leaving. Other than that the staff were helpful and happy. 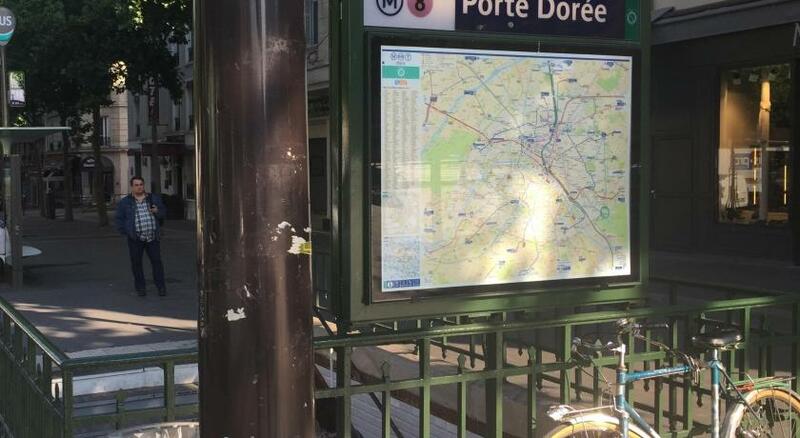 Perfect location for exploring Paris, Porte Doree is a beautiful suburb and the hotel sits right next to the park and zoo, rooms are comfortable and clean, staff are lovely, perfect base for exploring using all forms of transport! Highly recommended! Amazing service! Very comfortable and spacious room with all amenities! Would definitely come back again! Heating in room was too warm for my liking and Air Con not easy to cool room down. Had to keep door to small balcony and window open but traffic was noisy. Unfrotunately my room was facing the dual carriage ring road so the view was not ideal. Did not spoil my 4 day break though. Lovely new hotel, excellent staff and very good location. Very good value for money, comfortable room. Didn't try breakfast as not a breakfast person but got great coffeee at a reasonable price. Breakfast did look very good though! Would return tomorrow!!!! I like everything. Room clean and comfortable, the staff very friendly and helpful,Lobby hotel is modern.